Pool! Perfectly located, grand Savannah Style home in the heart of the historic disctrict. 4 Bedroom, 3 Bathroom on Jones Street. Keep cool and stay in comfort right down town Savannah. If you're making plans for Georgia vacations, then you'll probably be spending some time in beautiful historic Savannah. The best way to fully enjoy Savannah is to stay in vacation homes Savannah so you have easy access to downtown. Southern Belle offers a great selection of Savannah vacation rentals right in the heart of the historic downtown. One of our perfectly located Savannah vacation rentals is the Mint Julep Main house. This property is right in the heart of the historic district on Jones Street and within walking distance to restaurants and parks. This home sleeps a total of eight people in four bedrooms with four bathrooms. Like our other vacation homes Savannah, it is nicely stocked with all the things you need to enjoy your Georgia vacations. You can keep up with your shows with cable TV, check your email with Internet access, and all kitchen appliances and linens are provided as well. The Mint Julep Main features ceiling fans, fireplaces, a big porch and wood floors throughout. Get ready to have fun in Savannah by heading right outside your door. You'll find it easy to walk to several places in the historic downtown and one of the first places visitors like to head is Forsyth Park. This huge park covers 30 acres and is a hub for recreation and relaxation. The focal point is the grand iron fountain that was featured in the "Midnight in the Garden of Good and Evil" book and movie. Savannah is full of parks and some others include Tricentennial Park, Chatham Square and Chippewa Square. The latter was also featured in a movie as well, being the site of the bench scene in "Forrest Gump." Historic houses are another Savannah draw and you can visit the birthplace of Juliette Gordon Law, who founded the Girl Scouts, as well as the Isaiah Davenport House. River Street is a must-see part of the city, with its nine blocks of brick walkways filled with eateries, shops and galleries. It's a great place to walk and watch ships come in. Of course, you can also tour the city in a day with one of the many guided tours offered. You can walk, ride in a horse-drawn carriage or an old-fashioned trolley. 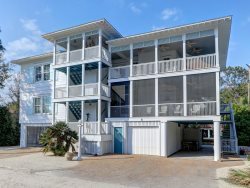 Make booking accommodations for your Georgia vacations easy by calling Southern Belle and choosing from our big selection of Savannah vacation rentals. Many of our houses are located right downtown and we have just about every size of vacation homes Savannah from cozy houses for just two, to mansion-sized houses for large parties. The property's features met all of our needs and exceeded our expectations in many areas. It seems obvious that you guys listen to customer feedback. The home had everything we needed and somethings we didn't know we needed until we were there. The home is comfortable and beautiful. It is within walking distance to city market and the river walk but it also far enough that you don't get the noise and traffic from all the tours and tourist.